Sussex will start the 2018 Specsavers County Championship Division Two season on Friday April 13 with a trip to Edgbaston to take on relegated Warwickshire. Following a visit to Leicestershire the week after, Sussex’s first home match of the competition is against Gloucestershire at The 1st Central County Ground between Friday 27 and Monday April 30. Division Two is made up of ten sides playing 14 matches each, meaning that Sussex will meet Kent (Canterbury), Glamorgan (The 1st Central County Ground, Hove), Derbyshire (The 1st Central County Ground, Hove) and Northamptonshire (Northampton) only once. That visit to Northampton starts on Monday 24th September and will be Sussex’s final game of the season. 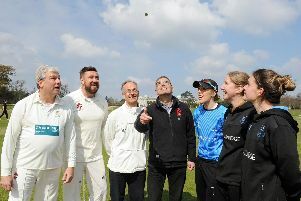 The Glamorgan match at Hove in July punctuates next year’s T20 Blast and will take place under floodlights as pink balls make an appearance in the competition for the second year in a row. Durham will be the visitors to Arundel Castle for the second time in four seasons for a fixture that takes in the longest day of the year. Other highlights include home and away encounters with 2015 County Champions Middlesex in May and August, a trip to Cheltenham College to meet Gloucestershire in July, the clash of the Division’s new Head Coaches when Jason Gillespie’s men take on Paul Nixon’s Leicestershire in April and September and Warwickshire’s visit to Hove in September. Sussex Sharks’ Royal London One-Day Cup campaign begins with a home fixture against local rivals Kent at The 1st Central County Ground on Thursday 17th May. The neighbourly theme continues two days later when Hampshire head to Hove. Sussex will also host Middlesex and Essex, with the latter providing the opposition for the Sharks’ final group game on Sunday 3rd June. That match will be held at Eastbourne following Sussex’s long-awaited return to The Saffrons last season. Sussex’s away trips in the competition will see the side head west for matches against Somerset, Gloucestershire and Glamorgan and north of the county border for a skirmish with rivals Surrey. Sussex will also enjoy an extra fifty-over match next season, with the touring Australians paying a visit to Hove on Thursday 7th June. Royal London One-Day Cup quarter-finals follow on Thursday 14th June. Semi-finals take place on Sunday 17th and Monday 18th June before a showpiece final at Lord’s on Saturday 30th June.